(Source: Jenn-Anne Gledhill) An actress playing a white rabbit guides the audience under the CTA tracks. Upended’s production of “Alice” opened last Saturday and runs until Oct. 21. 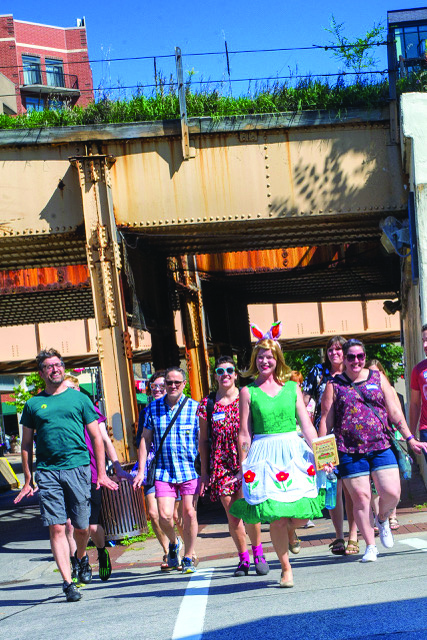 In Upended Production’s “Alice,” audience members go down the rabbit hole and experience Evanston’s Main-Dempster Mile as it transforms into Wonderland. Noelle Krimm, who serves as the Chicago-based theater company’s artistic director, originally created and performed the show in 2004, when it was brought to life in Andersonville as a Neo-Futurists production. Ten years later, she is performing the show again after launching Upended Productions. After speaking with Katherine Gotsick, the executive director of the Main-Dempster Mile, Krimm said the two realized Evanston could be the perfect fit for a reprisal. Gotsick said the show seemed like a “no-brainer” because it would bring people into stores and it aligned with Evanston’s interests. Gotsick worked with local Evanston businesses — like Sketchbook Brewing Company, La Principal, Chicago-Main Newsstand and others — to provide venues for the production, while Krimm rounded up roughly 60 performers from Evanston and Chicagoland to be featured in the show. Bilal Dardai, a contributing artist who has been involved in all three productions of “Alice,” leads chapter five in some of the shows, when Alice encounters a caterpillar. For his part of the show, Dardai delivers a live literature piece inspired by Carroll and the writings of journalist Hunter S. Thompson. Dardai, who was formerly an ensemble member for the Neo-Futurists, a Chicago-based collective of writers, directors and performers, said much of his work is focused on audience interaction and perception. A show like “Alice,” he said, is exciting because the audiences are always different, which influences each performance. While Krimm originally created the show to address how theater is evolving into a more interactive medium, she also sees the production as a way to support local communities. In past performances of “Alice,” she watched new relationships form between businesses and artists and noticed how show attendees would often come back to the stores and restaurants.